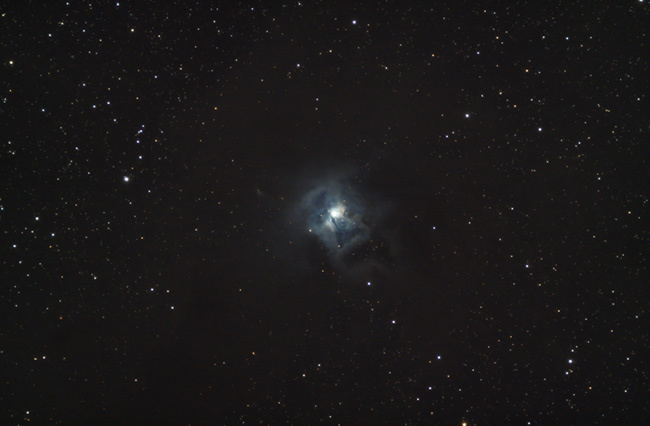 The Iris Nebula can be fully appreciated through astrophotography, as seen in the long exposure image below. The dominant color of this reflection nebula is blue, with interstellar dust lit up by a central young star. I have photographed the Iris Nebula through a variety of telescopes and cameras over the years, and it never disappoints. 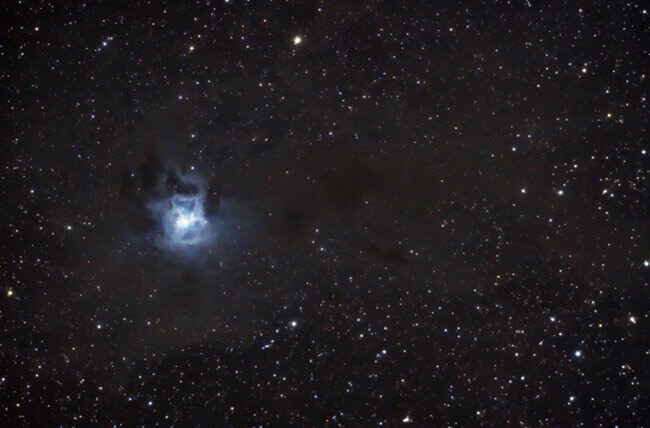 The photo above is an image of the Iris Nebula that I photographed while on a camping trip. 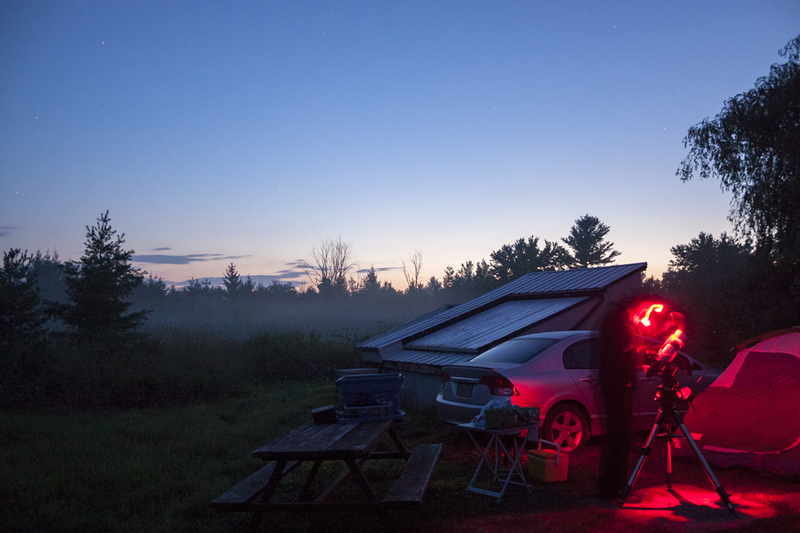 I had two astrophotography rigs setup that night, one shooting the Iris Nebula, and another one on the Andromeda Galaxy. The dark skies of this imaging location helped reveal some of the outer dust surrounding this nebula, even with a relatively short overall exposure length. In July 2017, I revisited the Iris Nebula. This time, the camera used was an Altair Hypercam 183C with a color CMOS sensor. 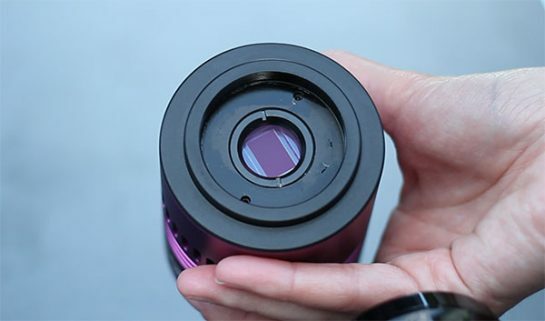 This camera is able to keep the temperature of the imaging sensor down with an internal cooling fan. Seeing as how the Iris is a summer astrophotography target, this certainly came in handy when capturing the Iris on a hot night. I try not to use my imaging conditions as an excuse for a mediocre photo. With that being said, imaging NGC 7023 from a red zone in the city without a CLS filter is a tall order! The dusty areas that surround this reflection nebula are barely visible in my photo. All of the light frames captured using the 183C were stacked in DeepSkyStacker using dark frames of an equal length and temperature. The final stacked image was brought into Adobe Photoshop for post-processing using my traditional deep-sky methods. As for the lack of CLS filter, I will soon be testing various 2″ round mounted models from Baader, Explore Scientific and Orion. 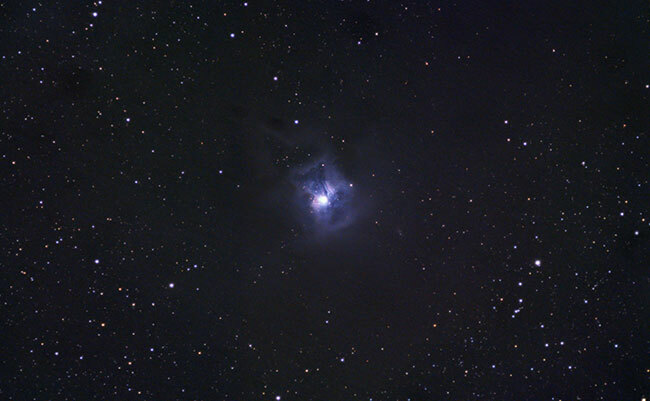 Unlike many of the emission nebulae in the night sky, there is little to gain by photographing the Iris Nebula using narrowband filters such as H-Alpha. This version is from the Summer of 2012 when I used a stock Canon Xsi (450D) with an Explore Scientific ED80 to capture the Iris. I tried to achieve a pleasing balance between the brightness of that gorgeous interstellar dust, and the background of space and stars. The dusty areas block out starlight behind them, and I absolutely love this image because of that feature. However, by pulling out those faint details, background noise is introduced. I used selective processing to separate the nebula from the background, so I could process them independently. Honestly, I think 2 more hours worth of light on this subject are needed to properly process this image to its true potential. The Iris Nebula is cataloged as NGC 7023, and resides in the constellation Cepheus. It is a bright reflection nebula with an estimated distance of 1,300 light years away from Earth. NGC 7023 is actually the star cluster within the nebula, but the cluster and the reflection nebula are one in the same. The nebula gets its trademark glowing blue appearance thanks to SAO 19158, the star responsible for lighting it up. An interesting characteristic of this object is the intense interstellar dust that surrounds NGC 7023, clearly blocking out the stars behind it. You can find this deep-sky treasure in your telescope Southeast of Alfirk, and North of Alderamin. 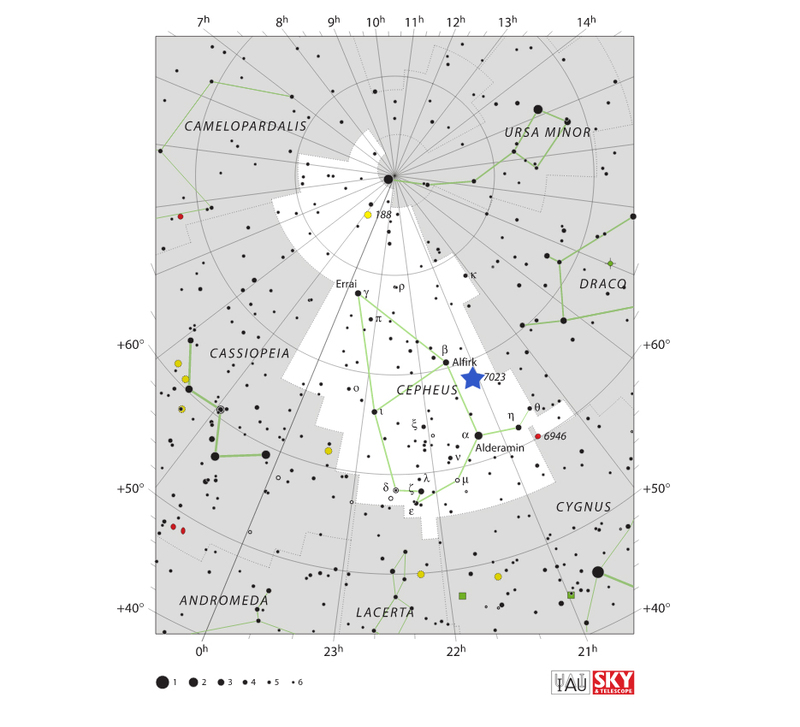 Please use the star-map below as a reference. The wide field view of the image of the Iris Nebula from 2012 was captured using my old astrophotography rig. I spent almost 3 straight months acquiring photos of the Iris Nebula whenever I had the chance. I remember driving to my dark sky location at midnight on a weekday at one point. I was obsessed with collecting as much light on NGC 7023 as possible. 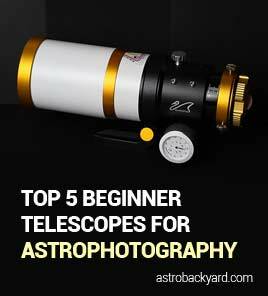 At the time, I was using an entry-level astrophotography tracking mount; the Celestron CG-5. 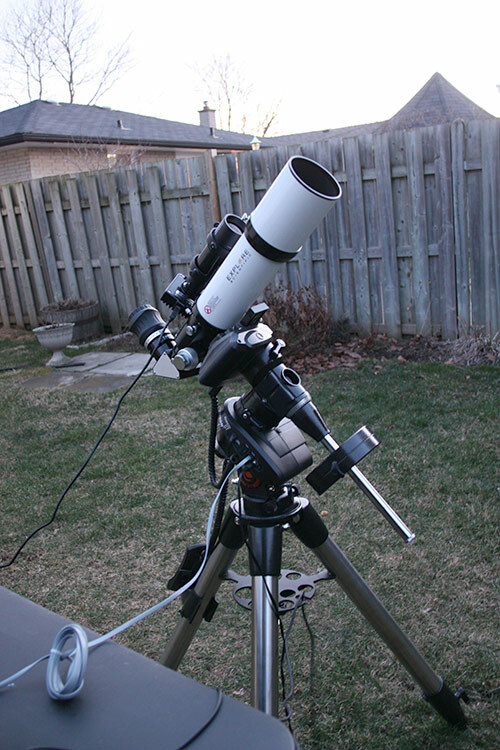 (Now called the Celestron Advanced VX Equatorial Mount). It was the “Advanced Series GT” model, although I am not sure what the differences were between this mount and the basic CG-5. Either way, it was my first German Equatorial Mount, and it got the job done! 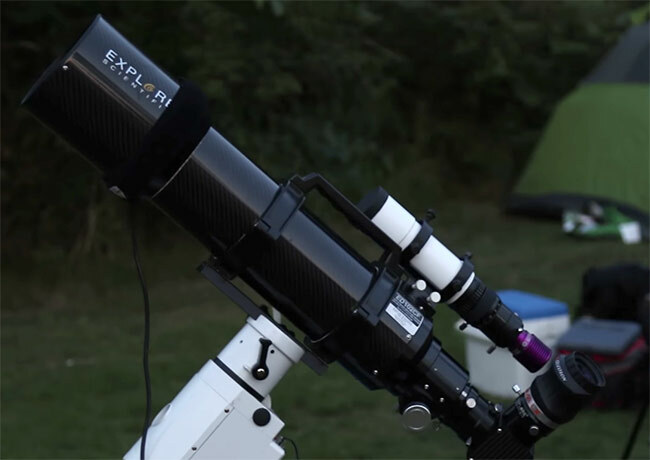 You can view the current astrophotography equipment I use to photograph deep-sky objects with my DLSR camera here.